Featuring eye-popping visuals, a raucous score, and a story that puts most live-action romantic comedies to shame, Corpse Bride offers far too much to take in during one viewing. Was your invitation lost in the dead letter office? Matt Anderson's commentary on Pixar's secret to success. Hint: it's the story, stupid. Poor Victor Van Dort (Johnny Depp, Edward Scissorhands). He’s the groom-to-be in an arranged marriage to Victoria Everglot (Emily Watson, Punch-Drunk Love), it’s a ploy to help her aristocratic, but financially strapped, family keep their aristocratic ways. Victoria’s a Victorian-era honey baby, but Victor’s something of a Van Dort dork and, while his fish merchant family has money, they lack class, social and otherwise. Victor’s worried about their not liking each other, but what’s love got to do with it? This is a marriage of necessity. Mercifully, Victor and Victoria turn out to have loads in common. The bigger problem is Victor’s such a nervous Nelly, he can’t remember his wedding vows. After making a disaster of the wedding rehearsal, the heat is on for Victor to rise to the occasion and perform well at the real ceremony. Frantic, Victor goes for a long walk into the dreary woods outside his dreary village, desperately repeating his vows all the while. Unbeknownst to him, somebody’s listening from the depths of the earth. When Victor pretends to ask for his dear Victoria’s hand, the Corpse Bride (Helena Bonham Carter, Planet of the Apes) leaps at the offer. For the third time in a row, Burton has crafted “the movie he was born to make.” Corpse Bride follows quickly on this summer’s Charlie and the Chocolate Factory and 2003’s Big Fish. There’s no mistaking a Tim Burton movie, particularly one that features caricature characters done in the same style as found in his book, The Melancholy Death of Oyster Boy and Other Stories. Burton’s approach is unique, to say the least, and, for some, it’s hard to swallow. Unlike his previous stop-motion animation features The Nightmare Before Christmas and James and the Giant Peach, which he produced, this time he’s also taken on directing duties with co-director Mike Johnson (Eddie Murphy’s PJs animated TV series). The end result is an even more complete Burton look and feel. When the Corpse Bride pulls Victor into her nether world of the lively dead, the screen is filled with images that conjure up thoughts of Jose Guadalupe Posada’s Day of the Dead art mixed with Salvador Dali. Loaded with wit and sight gags (the nether world’s Second Hand Shoppe sells exactly what the name implies), the humor is abundant in a very Tim Burton vein. In contrast to the dull, life-sucking grey of Victor’s village, the afterlife’s world is colorful, playful, and, yes, lively. No wonder, then, that at one point the Corpse Bride is asked, “People are dying to get down here, why get so excited about going ‘upstairs’?” Well, that’s all part of one of the movie’s intertwining plot twists that lead up to a very well-done finale. Corpse Bride is a musical-comedy that takes on some genuinely operatic airs. Danny Elfman’s score and songs zip along, accompanying dazzling, painstakingly created visuals. The best part of this tale of death-defying love is just how complicated the situation gets for poor Victor, both in situation and emotion. It’s ironic that Corpse Bride was released in a limited engagement on the same day as Reese Witherspoon’s Just Like Heaven went into wide release. In comparison, the latter is a light-weight piece of romantic comedy confection with a clumsy storyline that manages to work based almost solely on its charm. In Corpse Bride, a genuine love triangle develops between the principal characters that is quite absorbing and the sad realization is that one of those stop-motion hearts is going to get broken. Three cheers, then, to Burton for showing that emotional heft is not limited to high-priced actors or computer-animated cartoons. 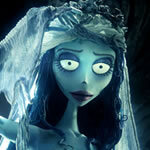 Corpse Bride is, in many respects, a mini-triumph.